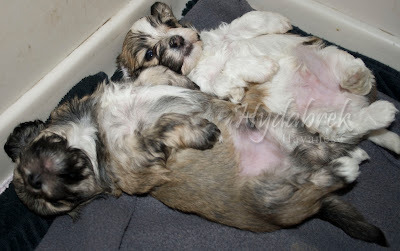 There is a reward for the successful capture of the "Havanese Belly Boys" Gang. Their crimes include looking too cute when on called for, bouncing around, playing until they fall asleep, tugging on your clothes, and licking your nose. If you see them, run, close your doors, and call the authorities. Their general cuteness is too much for the average person to handle. This has been a public service announcemnet. they look like little Ewoks!! hope you are enjoying these little babes and all the puppy breath too!